... 1951 (60 years ago today), Virginia Margaret Bell (right) was born in Australia. 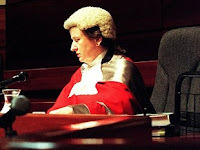 A law graduate of the University of Sydney who was admitted as a solicitor in 1977 and to the bar in 1984, she practiced in the private practitioner and as a public defender, then became a judge in the New South Wales Court of Appeal. In 2009, she was appointed a Justice of the Australia High Court. (photo credit) Bell "is the first lesbian to serve on the High Court, and the second openly LGBT person after Michael Kirby, whom she replaced upon his retirement."